Castings present a cost effect method to manufacture complex shapes. Casting design, however, does require specialized expertise and a knowledge of the strength & weaknesses of the process. 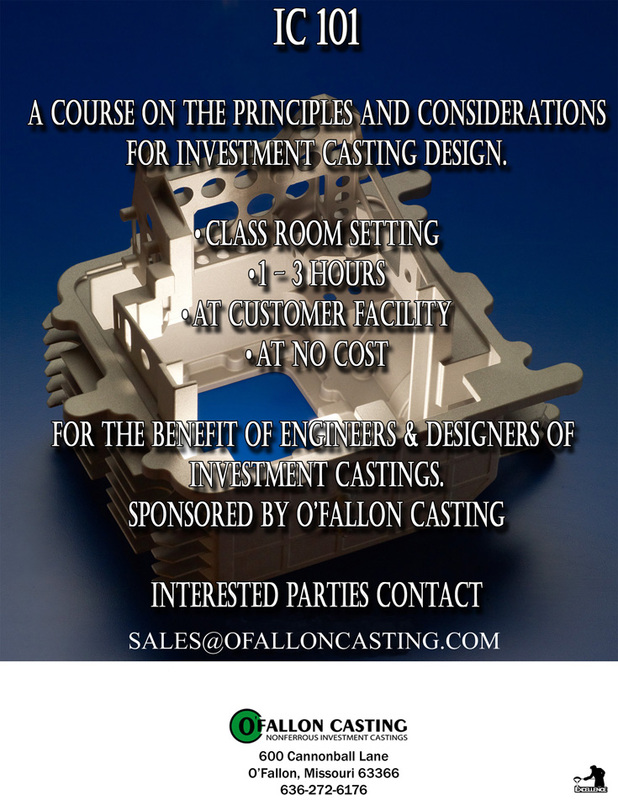 To assist customers in developing this expertise in casting design, O'Fallon Casting offers its IC-101 Fundamentals of Casting Design class. IC-101 is conducted at no cost, in a classroom environment, at a customer facility. The class reviews the basics of the Investment Casting Process, explores the Advantages / Disadvantages and Strengths / Weaknesses of Investment Casting, reviews the content of applicable specifications, and Best Practices for successful casting design. In addition, IC-101 reviews the industry status of new technologies such as Model Based Definition products, Laser Metrology and Digital Radiography.